Extreme cold weather has touched just about every region in the country this winter. Snow, ice and below normal temperatures have caused traffic jams and school closings, but many communities have also been opening additional shelter for those who have no other place to stay warm. Each year, as winter approaches and the temperature begins to drop, many homeless people move from the streets to their city’s shelter system to escape the cold. However, few communities have city-wide cold-weather response plans, and many of the plans currently in place leave gaping holes in accessibility. In rural areas, shelters often have no outside resources to help them cope with the increased demand caused by cold weather conditions. 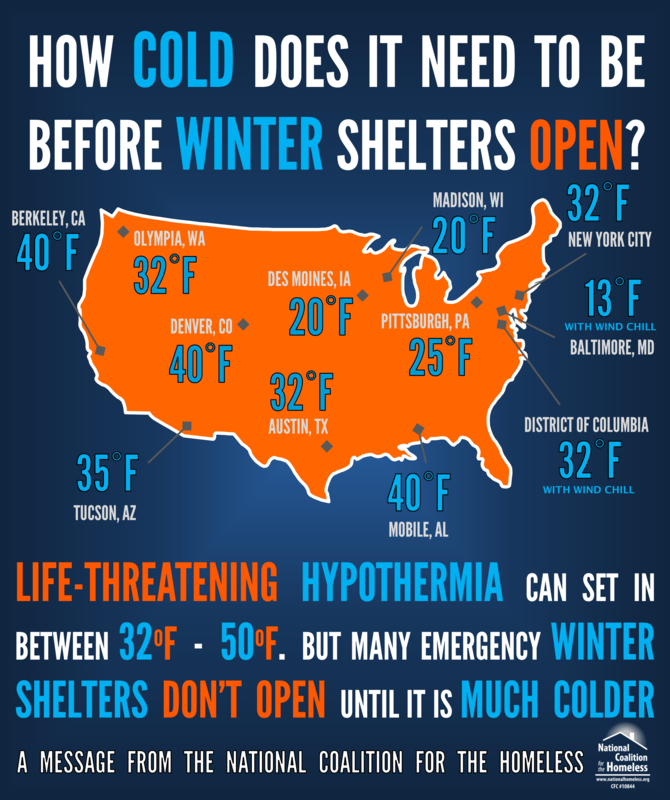 Many shelters or cities offer expanded winter services only during certain months or only when the temperature falls below a pre-determined and arbitrary cut-off temperature. Above those cut-offs (hypothermia can occur in weather as warm as 50 degrees Fahrenheit) many cities do not offer resources to help the homeless people escape from the cold. Without a carefully constructed winter plan, homeless service facilities may find themselves unable to accommodate the influx of residents, and some of those people who seek shelter are turned out into the cold. With nowhere to stay except the streets, people experiencing homelessness have a much higher risk than the general population of developing exposure-related conditions such as hypothermia and frostbite. These conditions can be immediately life threatening and may also increase the risk of dying from unrelated conditions in the future. Increased homeless services, especially additional shelter availability, are necessary to accommodate the amplified need in the winter. Ashville, NC closes Safe Haven as planned, but is everyone permanently housed? The discussion that communities are having around opening emergency winter shelters for increased numbers of families and individuals they expect to need housing this winter could easily be shortened by providing that elusive solution to homelessness: housing. The Obama Administration helped a great deal by providing permanent housing solutions through the American Reinvestment and Recovery Act. But funds for programs like the Homeless Prevention and Rapid-Rehousing program are running out this year. Our challenge remains to provide long-term housing solutions, while providing for the safety of families and individuals who have no place to call home tonight. Lots of communities are providing these long-term solutions, like the 100,000 Homes Campaign, along with other programs dedicating new sources of permanent housing and working as a community to provide the services people need. But the challenge still remains, how can we use what little funding is available to provide permanent and preventative solutions to homelessness, while ensuring that everyone who is homeless tonight has at least a warm bed and roof over their heads? YOUR concern for your homeless neighbors, or advocacy for the homelessness YOU may be experiencing, is more critical that it has ever been. Make homelessness a topic of regular conversation! Talk to your family, friends, neighbors and legislators about the need for housing solutions now. Let’s not sit by while families, brothers, daughters, parents freeze on our streets this winter.